Winter has struck ahead of schedule in much of the United States east of the Rocky Mountains. The latest target was the Upper Midwest into portions of the Great Lakes, which received a major snowstorm earlier this week. Hardest hit were the northwestern suburbs of Chicago, with Rockford measuring 13 inches of snow by Monday morning. Nearby New Milford, IL reported 12 inches. Officially at Chicago’s O’Hare International Airport, 8 inches of snow fell. The heavy, wet nature of the snow toppled trees and power lines and left more than 340,000 customers without power in Northern Illinois. 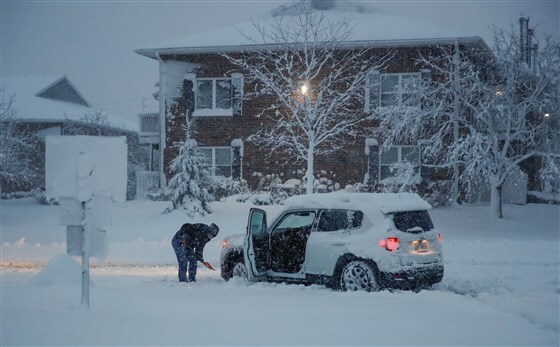 On Monday, the storm spread into Michigan, with Dowling, MI, located in the southwest portion of the state, reporting 11.5 inches of snow by Monday evening. The wet snow along with 30-40 mph wind gusts knocked out power to tens of thousands of customers in Michigan. While significant snowfall is not expected in these regions for the remainder of this week, longer range weather models are indicating the potential for another winter storm early next week. Details, however, remain highly uncertain at this time.